After a high-stakes game of chicken (which, incidentally, is also known as -- ahem -- "snowdrift"), D.C. Delegate Eleanor Holmes Norton confirmed that U.S. Capitol Police are not enforcing the ban on sledding on Capitol Hill Thursday. 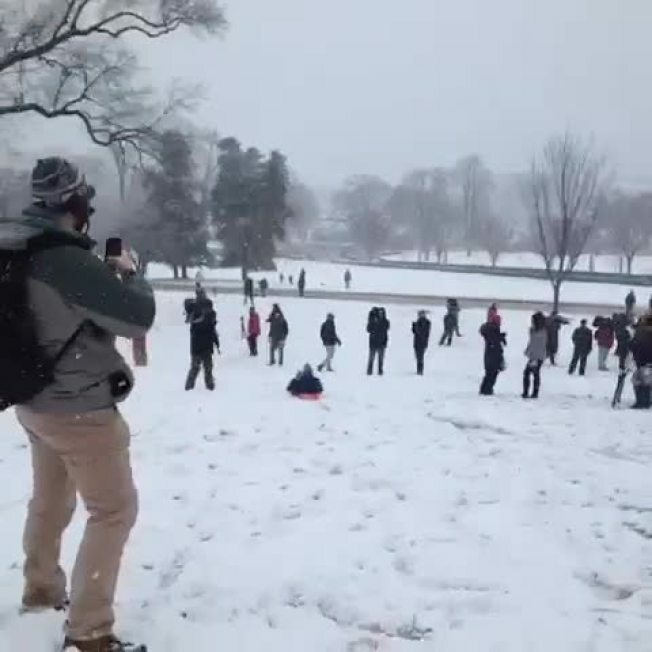 The announcement came after protesters held a "sled-in" on Capitol Hill on Thursday afternoon, despite a warning from Capitol Police that sledding is forbidden there. "No enforcement of #sledding ban on Capitol Hill today. Thank you Capitol Police!" Holmes Norton posted on Twitter. Photos show a few dozen children and parents gathered on Capitol Hill, taking advantage of several inches of snow that blanketed the D.C. area Thursday. Details about about the impromptu event showed up earlier Thursday on a Change.org petition, local blog POPville.com reported. "If you are up for a little civil disobedience, meet at the west front of the Capitol lawn" at 1 p.m., the Change.org page said in advance of the event. "Come armed with sleds!" The "sled-in" came after D.C. Del. Eleanor Holmes Norton asked for a one-time waiver of the ban. In response to her request, the Capitol Police Board issued a statement late Wednesday stating that, "for security reasons, the Capitol grounds are not your typical neighborhood hill or playground." The statement also said it was the job of Capitol Police to protect the Capitol grounds from being damaged. And, the statement added, sledding can be dangerous. "According to recent media reports, at least 20,000 sledding injuries occur in the U.S. each year," the statement from Frank Larkin, chairman of the Capitol Police Board, read. Holmes Norton had argued that Thursday's snowstorm would offer a perfect opportunity for local kids to get outside and enjoy the snow. "This could be the last snowstorm the D.C. area gets this winter, and may be one of the best for sledding in years," Holmes Norton wrote in her request. "Children and their parents should able to enjoy sledding on one of the best hills in the city. "Have a heart, Mr. Larkin," Holmes Norton wrote, "a kid's heart, that is." In the wake of the denial, Holmes Norton took to Twitter, cautioning people not to blame Congress. "Don't blame Congress for the ban on Capitol Hill #sledding," she tweeted. "The Capitol Police Board owns its regulations and can waive them." Playing on Capitol Hill in the snow is a goal of many kids in the District. During a late February snow, News4's Tom Sherwood received tweets from a skier who managed to hang on the Hill long enough to capture a video. That same skier later tweeted Tom that a "sad boy" had just been turned away from the tempting snow.